Summer puddings used to be a delicious seasonal treat but these days, with all the frozen fruit available to us, we can make them at any time of the year. With the availability of all sorts of fresh fruits year round as well, we can also substitute traditional fruits, such as strawberries and raspberries for more exotic varieties, such as mangoes, blueberries and pineapple. Going “sugar free” with these recipes really isn’t a problem. There are all sorts of alternatives when it comes to sweetening the dish, including using the fruit itself.Don’t forget to leave plenty of time to prepare this dish. It is always better to make it the night before if possible, in order to give the pudding plenty of time to settle in the fridge. 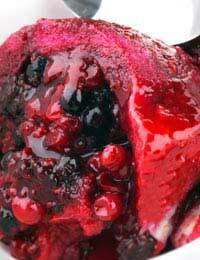 This sugar free recipe is based on a traditional summer pudding. Put a little honey in with your strawberries and raspberries for additional sweetness. Those who prefer their fruit to have a little bite, can easily leave the honey out. Wash and hull your strawberries and raspberries. Place them in a large pan with your honey and stir gently until some of the juices are released. Turn the heat on low and continue to stir. Do not let the fruit boil but do allow the honey to melt properly. Remove from the heat. Take a large pudding basin or bowl. Line the edges tightly with your sliced white bread, overlapping to ensure there are no gaps at all. Gently spoon your fruit mixture in. Take another slice of bread (or more if you are using a large bowl) and lay it on the top, so none of the fruit can be seen. Take a plate that fits neatly inside the top of the bowl, and press it down and in. Weight the plate down and put your bowl into the fridge. Leave overnight. Remove the pudding from the fridge well before you intend to eat it. Carefully turn it out. When ready to serve, slice and place into bowls. This dish is delicious with whipped cream. Try this sugar free recipe with any tropical fruit you can buy or you have in your fruit bowl. Use a little pureed banana to sweeten the dish. Once again leave plenty of time to make this dish. Take your ripe bananas, peel them. Then puree until there are no lumps. Place the banana puree in a large pan with 250ml of water. Peel and slice your pineapple into small chunks, then peel and de-stone your nectarines and mangoes. Place your tropical fruit in the pan with the banana and water. Turn the heat on low and stir until all the fruit softens. Remove from the heat. Take a large pudding basin or bowl. Line the edges tightly with your sliced white bread, once again overlapping to ensure there are no gaps at all. Gently spoon your tropical fruit mixture in. Take another slice of bread (or more if you are using a large bowl) and lay it on the top, so none of the fruit can be seen. Take a plate that fits neatly inside the top of the bowl, and press it down and in. Weight the plate down and put your bowl into the fridge. Leave overnight. Remove the pudding from the fridge well before you intend to eat it. Carefully turn it out. When ready to serve, slice and place into bowls. Try this dish with sugar free vanilla ice-cream.